Full moon falling over Annapurna Sanctuary in northern Nepal. This photo was taken over 4500 meters high in Himalayan mountains. We had to wake up in the middle of the night to catch the full moon in all it’s glory. Down in right beneath the ridge is Annapurna glacier that rumbles and cracks every now and then with amazing sounds reaping through otherwise dead silent landscape. 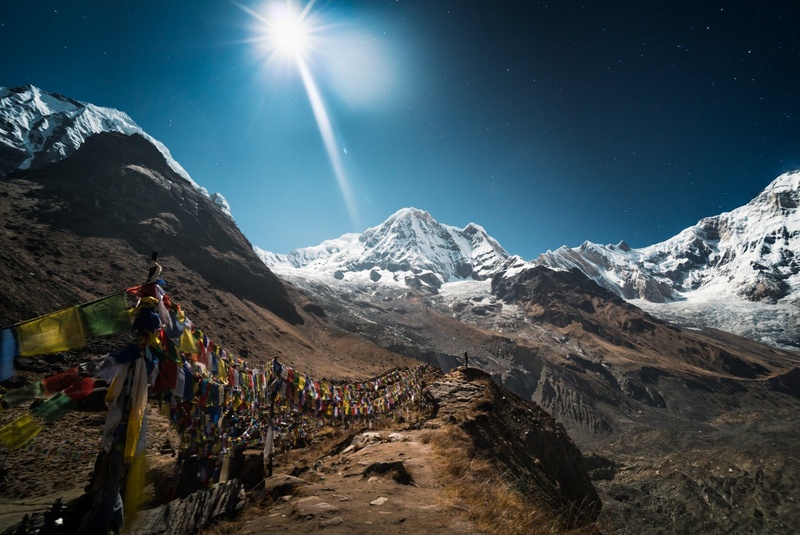 Annapurna mountain range is probably one of the most majestic areas for easy access hiking in the world. Of course it’s physically demanding and you will regret going there after thousands of stairs and 8 hours of cruciating walking, but in the end it’s all worth it when you see the snow covered mountain tops in bright and crips early mountain air. There is something about high mountains that is beyond words. When you in awe at snow covered mountain tops over 8000 meter high you’ll realise that if you ever tried to conquer them you’d be killed for sure. At least for me Nepal was all about hiking in the mountains and it lived up to all the expectations. I will be back there for sure because I have never seen landscapes like that before. And it’s really cheap to stay there for months with 90 day visa on arrival. 5/5.